An enormous thanks to A S Patric for his excellent and thought-provoking posts. Ali Cobby Eckermann has enjoyed huge success with her first collection of poetry ‘little bit long time’. Her poetry reflects her journey to reconnect with her Yankunytjatjara / Kokatha family. She has lived most of her adult life in Australia’s Northern Territory. Her first verse novel ‘His Father’s Eyes’ was published in 2011 by Oxford Uni Press. Her second verse novel ‘Ruby Moonlight’ won the inaugural kuril dhagun national Manuscript Editing Award at Qld State Library. She hopes to publish her poetic memoir later this year. Ali is currently co–editing an Aboriginal edition of Southerly, with her peer Lionel Fogarty. 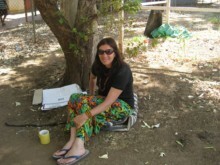 She has established an Aboriginal Writers Retreat at her home in Koolunga, and advocates strongly for grass roots Aboriginal voices to be heard through literature.